#1. Make a professional website. Think of your website as an online brochure for your writing. If your brochure looks unprofessional, who will want to buy a book from you? I recommend designSEO.ca, a company that does both website design and search engine optimization. Their specialty is search engine friendly website design. However any professional website designer could certainly do the job for you. Your primary goal is to make your site look professional so that potential buyers are not turned off by a website that looks like an amateur made it. Hot Tip 1 - Before contacting a website designer, figure out what content you want to be on your website first. Write out the whole website like you are making a brochure before you contact the website designer. This allows the website designer to give you a more accurate quote for how much it will cost to create your website. Hot Tip 2 - If your goal is to be able to update your website yourself you may wish to either learn HTML or choose a platform that allows you to create/design the website yourself and be able to update your website easily. Otherwise if you are regularly updating your website it will get expensive to be paying your designer $30 per hour each time you do a small update. #2. Have Business Cards and Bookmarks Made. A fellow author recommended the bookmarks. I have seen other authors who use business cards, but bookmarks can work just as well as a business card in terms of containing the same information, but in a different shape. The benefit of this kind of "swag" is that people are less likely to throw out a bookmark than a business card (but business cards are easier to carry in your wallet/purse). Once people have the bookmark/business card they are also more likely to look up your work and make a purchase. Having business cards/bookmarks allows you to interact face-to-face with potential fans. There might even be a surprise factor when they think you are giving them a business card and then they realize it is a bookmark. This creates a more memorable experience and every time they look at the bookmark they will be reminded of the time they met you, shook your hand, and they might be curious enough to buy your book. 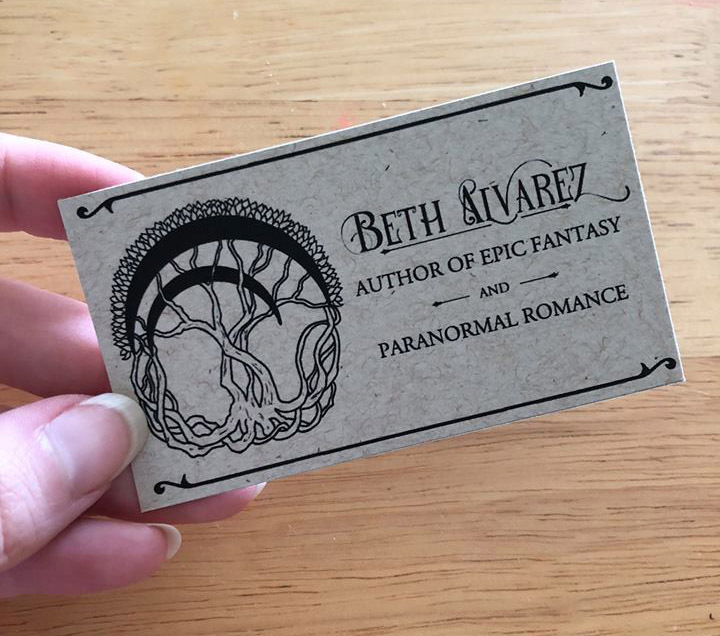 Hot Tip - Hiring a graphic designer to make your business cards / bookmarks makes them look even more professional. More expensive, yes, but also more likely to win over potential buyers of your books. #3. Make a professional Amazon Author page. If you are self-publishing and promoting your work on Amazon, this is pretty much a necessity. However many self-published authors forget to actually make their author page, so make a note to actually do this and also use it. Hot Tip - Make a paperback version of your books on Amazon. Amazon isn't just for ebooks any more. You can now make and sell paperback and hardcover versions too. Many people prefer to read a physical book so having physical copies of your books for sale means you are effectively doubling or tripling your available audience of buyers. #4. Claim your Author Profile on Goodreads. Claiming your profile on Goodreads is a good way to get more ratings and reviews of your work. Amazon only allows people who are in good standing who have purchased over $50 worth of things off Amazon to post reviews. Furthermore, Amazon tracks your Facebook friends so that your friends cannot post reviews on Amazon, thus Goodreads is an excellent alternative for reviews as anyone can post reviews on there. Hot Tip - Invite your friends who are big into reading fantasy to join Goodreads. They might even read your books and leave some nice reviews. This will help to get the ball rolling. Maps of your fantasy world. A thank you note to anyone who helped during the writing / editing process. If you buy ebooks by popular / successful authors on Kindle/Kobo/etc you may notice that many of them also fatten their books to make them appear longer than they actually are. This allows them to add extra pages to the length of the book and a longer wordcount. Further more, the fattening of your book is very handy for marketing reasons. It allows you to include a list of other books you wrote, which encourages readers to go out and buy your other books. Likewise having sections for About the Author, Author's Notes, a List of Social Media accounts and other topics can also be very beneficial to get readers to buy your other books, follow you on social media, etc. #6. YouTube Readings and Promos. Pick a chapter or two from your book and read it on YouTube. You could do this live (and don't care whether you make any mistakes while reading) or you can more carefully narrate the book and edit out any mistakes you make. Depends which method you think will work best. You can also make videos to announce promotional sales / free books, timing them with Amazon's KDP Select program. Got something to say to your fans? Make a personal video. Hot Tip - Why pay for a social influencer when you could become a social influencer? Promote your own work and don't rely on others to do it for you. This way when people do promote your work on YouTube they are doing it for free. You can use Twitter and Instagram in much the same way as you use YouTube, uploading videos (usually shorter videos), but you can also post short updates on Twitter about your writing if you want to, interact with fans, and interact with other authors. eg. I follow several authors I find to be of interest on Twitter and I am always pleased when fellow authors respond. So you can waste a lot of time on Facebook and accomplish nothing if you are not careful. You have been warned. I regulate my time on there. You should absolutely have a Facebook page, where you can post the same videos and information you post on YouTube, Twitter and Instagram. However Facebook also has a lot of groups you can join about fantasy books where you can potentially promote your books and get sales / reviews of your work. Joining groups for Fantasy Authors won't bring in the sales, as these people are more interested in selling their own books, but that is a good place to meet similar authors who you could collaborate with on anthologies if that is something you are interested in. Those groups are also a good place to discuss the writing process and ideas. The one group I am going to recommend is joining Fantasy Authors & Marketing, a group specifically geared towards authors both sharing their work and also sharing marketing techniques. In fact I am going to be posting this blog post on there shortly. #9. Get a Discord account. So Discord was originally used (and still is used) by gamers as a forum to discuss video games, but it is increasingly also being used by people wishing to discuss movies, TV shows and books. Having a Discord account allows you to communicate directly with people who read fantasy books and mention your book in the process. I don't recommend using it for blatant marketing, but rather as a way to engage with fans of the fantasy genre. Discord also allows you to stream video, which means you could do live readings of a chapter of your book. Discord is increasingly popular, which is why it made this list. However if you aren't really into conversing with potential fans then maybe Discord is not for you. Hot Tip - Try not to offend people when talking to fans. No better way to get a negative review than to annoy people. #10. Search Engine Optimize your Book Title. There are many ways you can use SEO to promote your book, but depending on your book's title it might be wise to do what is known as a Google Bomb. So you create lots of links using that specific phrase which goes to your book listing (either on your website or on Amazon), which may or may not contain that phrase as well. It is certainly easier if your book title is the phrase in question, but it doesn't have to be. It could simply be a phrase used in the description, or it could be part of the tagline or logline. If your Google Bomb is successful, whenever someone types in the phrase in question the very first result at the top of the search will be your book. The goal here is to get volume, more people seeing your book equals more people who may be tempted to buy and read your book. Even if your book title is not a popular phrase you should still spend some time promoting the book in links / SEO so that when people do eventually type in your book title that they can find your book easily. Hot Tip - While you are at it you should Google Bomb your own name (or your pseudonym if you are using a different name when publishing) so that when people do a search for the name they can find your website easily. If you use multiple pseudonyms you should have them all go to your main website. Okay, so you need to experiment with Pay-Per-Click / PPC advertising before you learn how it works. I cannot summarize it fully in a few paragraphs in any adequate means. The point here is that you don't want to waste your money advertising your book if it is not selling, thus experimentation is key. Furthermore there is a pricing issue to consider. If you are selling your book for $2.99 each then you are going to have a hard time making a profit. You might be spending anywhere from 5 cents to 20 cents per click, and because Amazon takes 30% of each sale you only make $2.09 per sale and Amazon takes the other 90 cents. It might take you 10 or more clicks just to get 1 sale, thus costing you $2 or more just to make 9 cents. You could even lose money doing this. What might potentially work is when you are selling a longer book, a trilogy or a set of books for $9.99. Suddenly your profit margin has shifted. For every book sold you make $6.99 and Amazon takes $3. If it costs you $2.50 to get one sale, suddenly advertising via PPC does actually make more sense as you make $4.49 off every sale. If you can get that cost down further to less than $1 by paying perhaps 5 cents per click then your profit margin just went up. The other issue with PPC is branding. Sometimes it isn't about getting people to click on your advertisement. Sometimes it is more important to build brand name recognition, but this usually isn't something you should worry about until you are more successful and can afford to focus on branding. Hot Tip - If paying for clicks in an effort to get sales is not working or seems like a silly method to you, then don't do it. Nobody is forcing you to. Also even if it does work for the first while, it may eventually stop working due to saturation levels. You may need to only to do this during the initial book launch and then phase it out after 3 months or so. So I have had Nerdovore as a blog since 2011, but I only recently started to use it to promote my writing. Usually I use it for talking about Game of Thrones, Dungeons and Dragons, fantasy cartography/map-making, "nerd food", and all sorts of nerdy topics. In the past 8 years this blog has gone from a hobby to a profitable hobby. I make money off the advertising on the side, so that is a nice bonus. 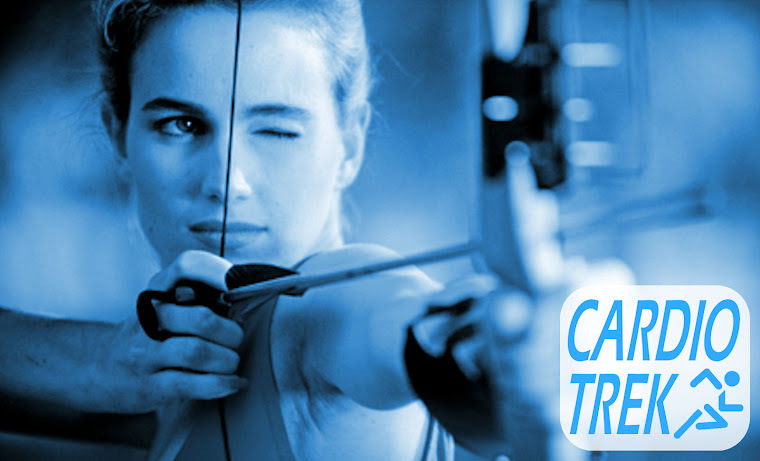 I also use this blog to promote my other website, Cardio Trek, which hosts my personal training / sports training / archery business. Archery students come from all over the world (eg. South Korea, Saudi Arabia, the USA) just to study archery here in Toronto under me. So that is working out for me financially. I cannot complain. 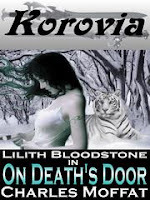 So it makes sense that I should also use Nerdovore to promote my writing, which in my case often means talking about the writing process with respect to fantasy writing and rarely even mentioning my own work. I suppose I should talk about my own work more often, but lately I have been more interested in blogging on subjects related to sub-genres, book lengths, where I get inspiration from, etc. Note - You don't need a blog. It isn't a necessity. Some authors use their Facebook pages as a blog. eg. Tomi Adeyemi's Facebook page is essentially a blog and she has a tonne of followers. Hot Tip - Having a blog is also a great way to post samples of your chapters, short stories, or even shorter examples of your work such as poetry or fables. Note - If you don't know what I am talking about, let me explain. Amazon Kindle offers a service called Kindle Unlimited, which allows users to pay $9.99 per month and they can read as many ebooks as they want (mostly from indie authors and small press publishers). 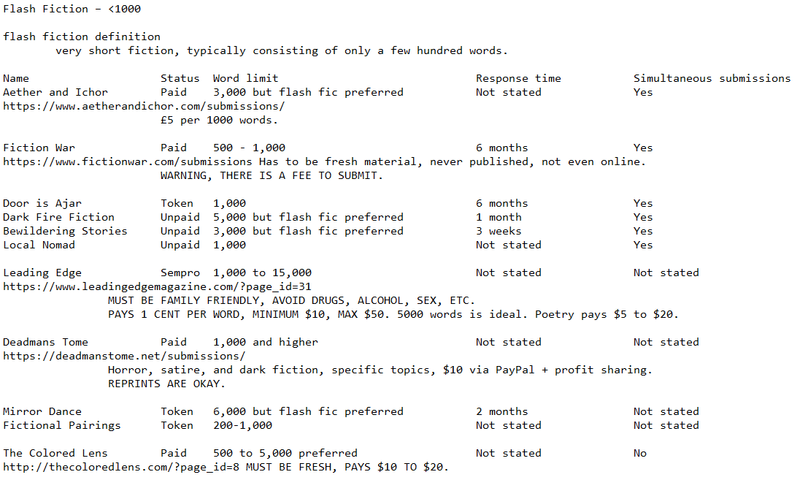 Most of that money then goes into the KDP Fund which then pays authors based upon the number of pages people read. Usually people get paid about 0.5 cents per page. So if 5 people read your 400 page book, so 2000 pages total, in one month, you get paid an extra $10 for that month. It might not sound like much, but it is also useful to the authors so they can boost their popularity, get more reviews, promote their work via word-of-mouth, etc. Now there are a number of reasons why the KDP Fund is constantly fluctuating. More people keep joining Kindle Unlimited every year. The influx of new readers every year means that in order to maintain that 0.5 cents per page payment system, they need to increase the fund. Reading ebooks is mostly a thing for young people. But as each year passes by reading ebooks on your phone / tablet is becoming more acceptable. Smartphones / tablets are also increasing in popularity overseas. KDP Select is a global fund, for all languages. So as more people join internationally, the more Amazon needs to raise the fund total. 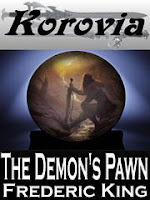 For indie fantasy writers like myself (see my Amazon Author page for Charles Moffat) being in the KDP Select program is an opportunity to get my books seen by more people. Currently I have 10+ books on Amazon Kindle and I am studying the best ways to market them. Marketing my books, sadly, is an annoyance to me. I would love to be able to just have my books available to people, word-of-mouth spawns sales, and I don't have to do any marketing... or marketing research... and so forth. I would much rather spend my time writing fantasy books or reading fantasy books. But that isn't the way the system works. You either market your work, or you don't get sales. So the biggest benefit of KDP Select is that it does a bunch of the marketing for me, as people reading your book on Kindle Unlimited counts as sales, even if they did not pay for the book. Which means more time for me to focus on my writing. Should I be allowing my books to be in the KDP Select program constantly? Or just a few months per year? And if so, which months? Since being in the program is a minimum of 90 days (and renews every 90 days unless you remember to turn off auto renewal), one could in theory only join for January/February/March. That in theory would be the best 3 months of the year to join. Or... you could leave the books on there constantly. Or if you have 10 or more books like I do, you could rotate how often your books are on there, and which books are being rotated on there. So for myself, I am going to try experimenting with different options and strategies and see what works. Whatever does end up working for me however might not work for everyone however. Different authors might have very different target audiences. And now back to writing fantasy... instead of writing about marketing fantasy. 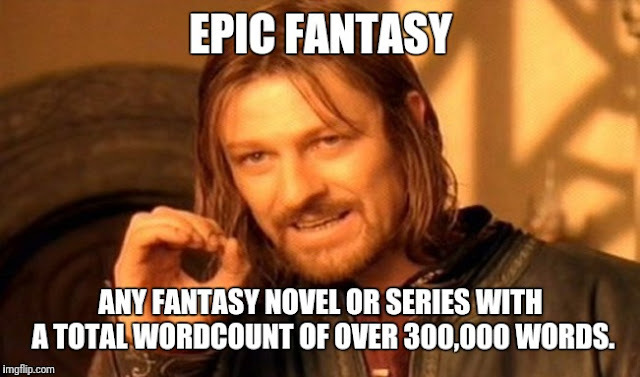 3,000,000 words is definitely epic however. eg. The Wheel of Time series of books has a wordcount of over 4 million words. However there is a flaw here. The 2nd definition states that it is "any fantasy novel". Literally any. It could be a comedy, a rom-com fantasy, or even a musical... It doesn't provide any definition with respect to plot or subgenre. The 1st definition however goes in the opposite direction. 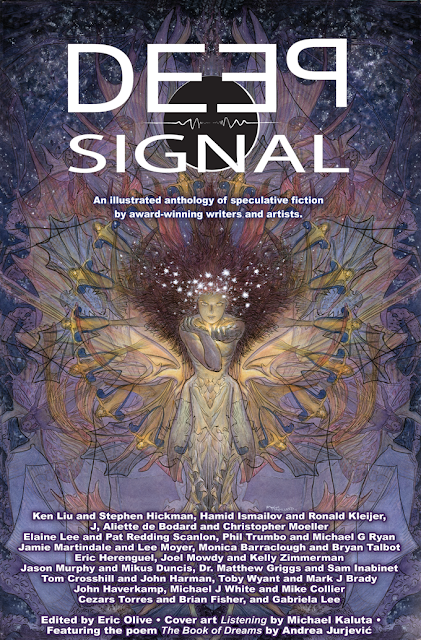 It is specifically talking about subgenre with respect to plot, setting, themes, etc. But there is a distinction in the 1st definition. There is no wordcount requirement. It could be an epic fantasy short story. 1,500 - 7,500 words. 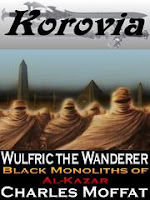 Or an epic fantasy novelette. 7,500 - 17,500 words. Or an epic fantasy novella. 17,500 - 40,000 words. 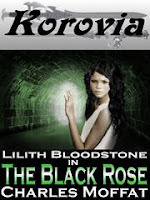 Note - See my previous post about short story, novelette and novella wordcounts. 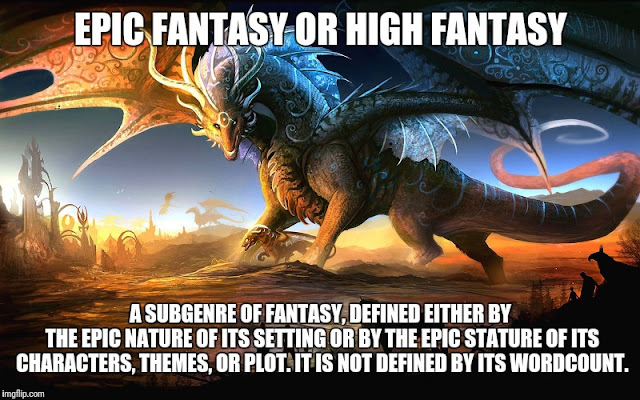 Basically the point is that epic fantasy is a subgenre based on the story's themes, plot, etc. The total wordcount doesn't really matter. This idea that epic fantasy has to be really long appears to be the result of the confusion. 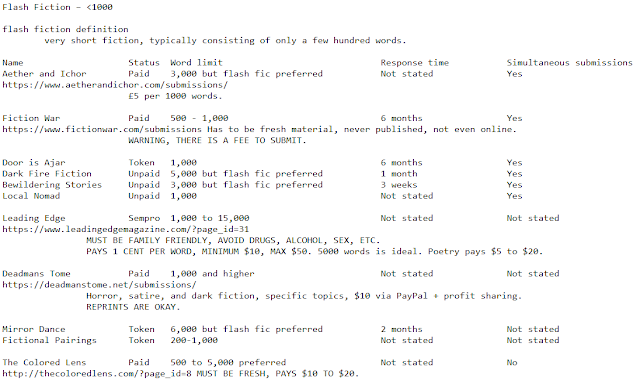 People are confusing the subgenre with the wordcount, as if wordcount actually matters to tell a good story. Thus for me, the first definition is the correct one. However, what is sad is when writers write a book and then call it "epic fantasy" without actually understanding the themes found in the subgenre. A great battle or battles between good and evil. A long epic quest, like trying to destroy a powerful artifact in a volcano that is thousands of miles away. Heroes that are often destined for great things. Usually has a villain who is the main big bad. eg. Sauron, Voldemort, Darth Vader. Thus if a story depicts an epic journey and battle, with a hero that is destined to defeat "the Dark Lord" or some similar villain, and manages to keep the story under 7,500 words... then it is epic fantasy. Is it easier to depict the "epicness" of the journey and battle if you have more words? Yes, probably would be easier if you could write something longer. Writing an epic short story could be quite a challenge. So if you are looking for a writing challenge and you enjoy epic fantasies, perhaps this is a writing challenge worth doing? 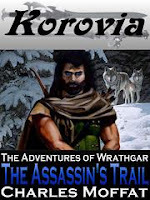 Why not write an epic fantasy short story and then leave a comment below with a link to it? Myself, I am thinking of doing it, but making it a fable about a legendary warrior. After all, there is no rule saying a fable cannot be 7,500 words. Some of my current fables are already quite long, with fables inside of fables. So for example I recently started a dark fantasy/mystery novella, which I had originally hoped to co-write with someone else, but now I will either never finish it or I will have to finish it solo. Just one of many ideas waiting to be made into something finished. One of my sources of writing inspiration is, oddly enough, conspiracy theories. 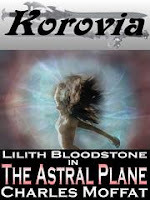 I find they make for great fodder for writing fantasy, science fiction, mysteries and all sorts of topics. Now you don't have to believe in the conspiracy theory to make use of it in a fictional story. Believing in it is not a necessity. Making use of it and researching the theory, even if you know it to be false, that is where the fun part comes in. Especially if you combine multiple theories for the heck of it. JFK was assassinated by aliens. The earth is really flat, but the aliens don't want us to know that. So yes, that is three separate conspiracy theories, but together you can now have fun with it. You can say JFK was assassinate by aliens because he wanted to reveal that the earth was really flat. The moon landing was faked by the government, because they knew of the existence of aliens (and that the earth is secretly flat). There you go, three conspiracy theories smacked together to form one central theme of the book. It doesn't matter that is complete nonsense, you could sell this book at flat earth conventions and people there would gobble it up because it feeds into their belief structure. 9/11 was faked by the Bush Administration as an excuse to invade countries for their oil. The leaders of various religions knows aliens/demons are real, thanks to ancient texts. Tin foil hats really do prevent aliens from reading your thoughts. Okay, so that was fun. But what happens when we combine all 3 conspiracy theories? Well, that means various governments and religions knows about the existence of aliens/demons. 9/11 was faked to get oil, but it is ultimately because the USA needs the oil to fight the aliens/demons. Every American president has surgery to add tinfoil around their skull to prevent the aliens from reading their minds, but with Donald Trump they botched the job, making his hair look funny and he suffered brain damage (because brain damage would explain everything Trump does). Also military submarines, airplanes, aircraft carriers, and even the helmets of combat troops all contain a layer of tin foil to prevent the aliens from reading the minds of the military. Also if you combine this book 1 from further above, you now have a sequel. Lets kick it up a notch for book 3. Every American president during the past 70 years has been a descendant of King Charlemagne, and every monarch / president globally is also a descendant of Charlemagne. The Queen of England is a descendant of Muhammad. All of the monarchs in Europe are secretly descendants of Jesus Christ. Jesus Christ, Muhammad and Charlemagne all knew about the existence of aliens/demons. There you go. Book 3, ready to ship to millions of flat earthers who will believe this nonsense. You can even push the idea that actually all the leaders are descendant from Jesus Christ, Muhammad and Charlemagne. That they all belong to a secret order of people who know about the existence of aliens/demons, that the earth is flat, etc. This forms the basis of the deep dive into the history of this fictional flat earth. Now just because you have the basics, doesn't mean you have a plot. Twenty different writers using this would have completely different plots, different characters, different villains, etc. Everything would be different, despite the core principles of the fictional world being the same. What we just did was effectively an exercise in World Building, but also a narrative exercise with respect to drip feeding the plot to the readers. To keep it interesting, you don't give them all that information in the first book. No, have to give it to them slowly over a period of 3 books. 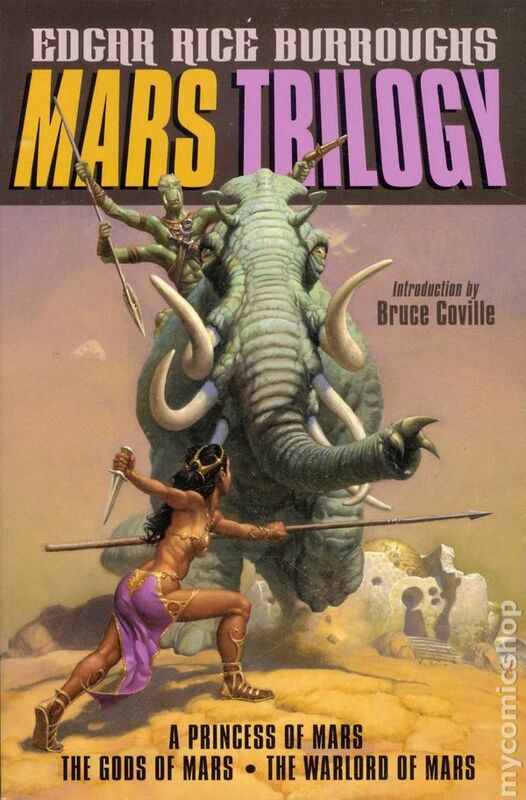 Think of the John Carter of Mars series (Edgar Rice Burroughs). ERB drip feeds parts of the planet one section at a time, revealing only part of it to the readers in each book (and sadly repeating the old save-the-princess plot in every book). ERB would have love playing Super Mario Bros. But as I already pointed out, I already have other projects I am working on. And too many ideas for books. I have seven novels I am already currently working on. I don't need more. Also, writing a series of aliens/flat earther books just isn't my thing, even if I did come up with the idea. So feel free to take this idea and run with it. Or find a different conspiracy theory and then run with it. No shortage of them out there. Or send me an email or tweet, and I will give you 3 story ideas fresh off the press. I never get writers block. My only problem is lack of time to write everything.